Planning is the process of making plans of something. Without a plan a goal is just a wish! A plan involves strategy which is a method or plan to bring about a desired future or solution to a problem. This involves organizing your ideas or activities required to achieve a desired goal. When you plan a trip, you start with the destination and map out a route to get there.What is your plan? A destination is much easier to find than a goal, but no less important. You would not get on a plane, bus, train without knowing where it is going, yet you can easily meander through life without goals or plans. Defining a goal is much more difficult! It is very similar to defining a problem. You can use SMART goals to help you define your goal. 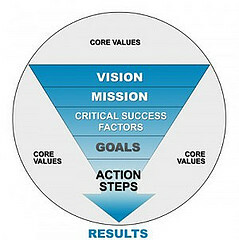 Your goal should be Specific, Measurable, Attainable, Realistic and Timely. Just setting the goal is not enough! Make sure you are really motivated to succeed. What is your strategy or plan to achieve your goal? In other words, how will you get it done? If you wanted to enter a marathon, you would need to prepare for it. It would take months of much shorter runs so you will build up the stamina for a marathon. Start small and allow sufficient time for success on the shorter runs. The same strategy works for almost anything. I usually start with the goal or outcome and work backwards to find daily/weekly/monthly tasks or objectives in order to reach my goal. What is your strategy? How do you know how you are doing? You have to monitor your progress. I monitor my progress daily! It is much easier to adjust my effort if I monitor my progress often. Besides it takes much less effort to readjust if I missed an objective on a daily basis. I also think it keeps it simple. I can stay focused on a daily objective and it takes a lot of small tasks to achieve a goal. If you pay attention to the small details, the goal will take care of itself. Failure is lack of success! Failure is when you decide to give up. Everyone fails at one time or another because you cannot bat 1,000. If you are doing anything, you will make mistakes. Learn from your mistakes and continue on. You can still succeed unless you give up. The difference between failing and failure is giving up. Successful people keep trying or change their strategy in order to succeed.” Insanity is doing the same thing over and over again and expecting different results.”(Albert Einstein) You always have another chance to achieve your goal. How do you handle failure? The last part of any plan is to evaluate how you are doing or did. Evaluation is supposed to be an objective or systematic analysis of completed or ongoing activities. Success is as important as failure for learning. Some may say, why bother? The more you put into evaluating your strategy, goals and plan the more you will improve your decision making, problem solving and judgment. In other words, next time you will do better. Some people do not bother with goals because it requires that you have to do something. You probably know these people; they talk about doing something, but do nothing! All talk no action! They may even go so far to tell you what they are going to do and never do it. They must think that just talking about it will get it done or achieve their goal. It seems as though they are giving up before they even start. Planning requires action!